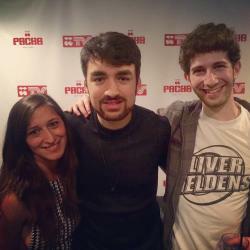 The track, which was going round the club scene for a while now, was officially claimed as the duo's newest record during a special Twitch live session. Announced as ‘Two Epic Mystery Guests’ both artists appeared behind the decks for an exclusive DJ set, during which they presented Aftermath. Now this is quite the news, especially since Quintino & Sandro Silva helped shape the MainStage electro sound with their 2011 single Epic, which overtook the world by storm after Tiësto premiered it during his set at EDC Las Vegas that year. After that, electro music hasn't been the same, getting bigger and bolder, while Quintino grew out to become one of electro music’s main figures. With Aftermath, the epic duo is back. Coming out June 19th on Spinnin’ Records it looks like another storm is upon us, the track already getting played by Hardwell, Dimitri Vegas & Like Mike, Martin Garrix, W&W, Showtek, Laidback Luke, Sander van Doorn & Ummet Ozcan –who knows where this collab will take us this time.